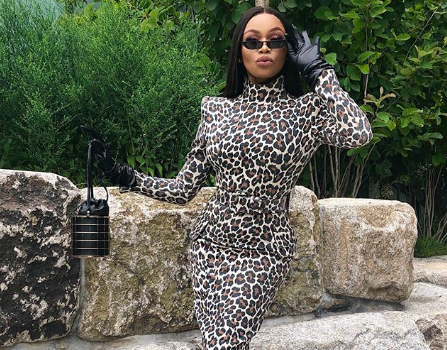 Bonang Matheba's tax woes are finally over! South Africa's media darling Bonang Matheba can finally put her tax fraud case behind her. The 31-year-old has reportedly agreed to pay a R30,000 admission of guilt fine. She was facing 15 counts of tax evasion related charges. TshisaLIVE reports that R22,000 was paid for failing to pay personal tax from 2008 - 2017 and R8,000 for not paying company tax from 2014 - 2017. The Johannesburg Specialised Commercial Crimes Court has reportedly struck the case off the roll. Shortly after the case was finalised, Queen B took to Twitter to send out some cryptic tweets, which some of her followers believe were directed at her haters. "......try again honey," she wrote in one post. The TV presenter added in another: "....we’re only available in the new year...."
Twitter users claimed it was Bonang's way of letting those who hoped to see her fall know she is fully booked in December and will continue earning fat paychecks? Some believed she was sub-tweeting the court. Some Twitter users felt she got a slap on the wrist. Someone please break this down for me. Does this mean Bonang Matheba has a criminal record...and, since she only paid admission of guilt, does she then make arrangements to pay the millions which she was said to be owing. Or?